The Frenchman's Food & Wine Blog: Solo Pizza, Coode Street Como (corner South Terrace) - questo Carne! 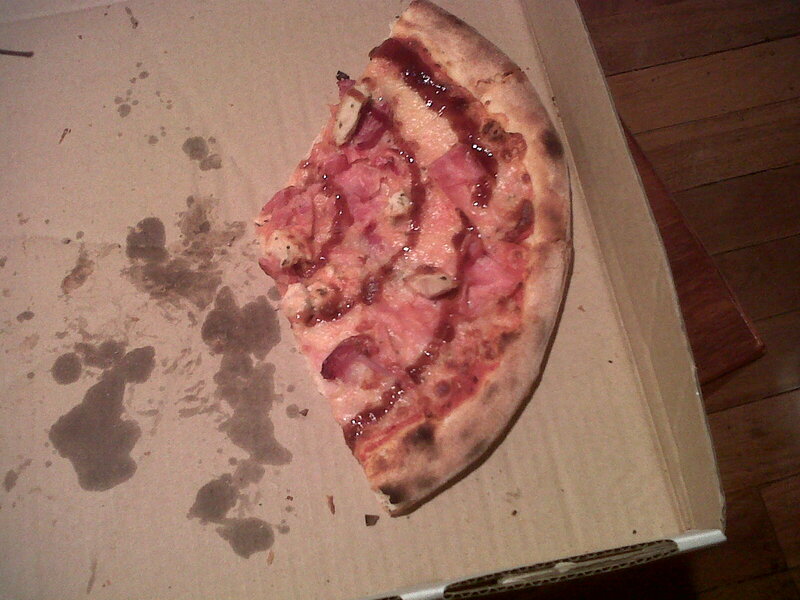 Solo Pizza, Coode Street Como (corner South Terrace) - questo Carne! I seriously love this pizza place. Finished work late, am starving but too shattered to bother with cooking. It's 9.15pm, but I decide to see if Solo Pizza is open. Yes it is - shuts at 10pm! Open every evening from 5pm except Mondays (yes it's even open on Sunday night!). I'm troppo stanko and can't think, so I order my go-to pizza - the Carne. Have had it about 3 or 4 times since my last review. A beautifully simple yet flavoursome and satisfying meal of ham, prosciutto, chicken and salami. I tell you what, even in my state, I can't but help engage Gio and Stefi in animated conversation while we're waiting for the pizza to cook - these guys are always cheerful, I love it! It almost feels like I'm at a friend's place and we're just standing in the kitchen having a casual chat. Get the pizza home and I wait a couple of minutes for the pizza to cool (I learnt my lesson the last time my palate was peeling for a few days ...), then I tear into it. Oh joy. And as if it can't get any better - they're going to start selling Stefi's own version of tira misu. Laboriously hand made, because she feels that using a blender results in an inferior quality product. I'm not a dessert kinda guy. But I can't wait to try it.